Jacksonville, Florida – November 7, 2017 – The University of St. Augustine for Health Sciences (USAHS), a leading graduate institution that emphasizes health and rehabilitative sciences education through innovative classroom education, has awarded Dr. Jon Edenfield OTD, OTR/L with its 20th Anniversary Occupational Therapy Professional Award. The award recognizes an individual who has demonstrated outstanding commitment to the occupational therapy profession in leadership, advocacy, service, scholarship, mentorship and innovation. Dr. Edenfield was selected from more than 1,400 graduates of the University of St. Augustine for Health Sciences’ (USAHS) Occupational Therapy (OT) program, which celebrated its 20th anniversary this year. Dr. Edenfield is currently a director and founder at Great Strides Rehabilitation Inc., and a resident of Jacksonville, FL. Edenfield attended USAHS during the university’s inaugural OT program, and was among the first to receive a master’s degree in Occupational Therapy from the university. He graduated in 2000, and was presented with the top honor for his class, the Outstanding Occupational Therapy Student Award. In 2004, Dr. Edenfield founded Great Strides Rehabilitation, which provides Hippo-Therapy and Therapeutic Riding services to children. Over the past 13 years, he grew a one-room clinic, providing only occupational therapy, to a 12,000-square-foot facility employing more than 85 therapists of various disciplines. Great Strides Rehabilitation has been recognized locally for the broad range of unique programs it provides to children with special needs. Edenfield also earned his doctorate from USAHS, researching his capstone project for three years, titled “Pilot Study: The physiological effects of animal assisted therapy on children with autism spectrum disorder.” His findings were published in the Journal of Physical and Occupational Therapy in Pediatrics. 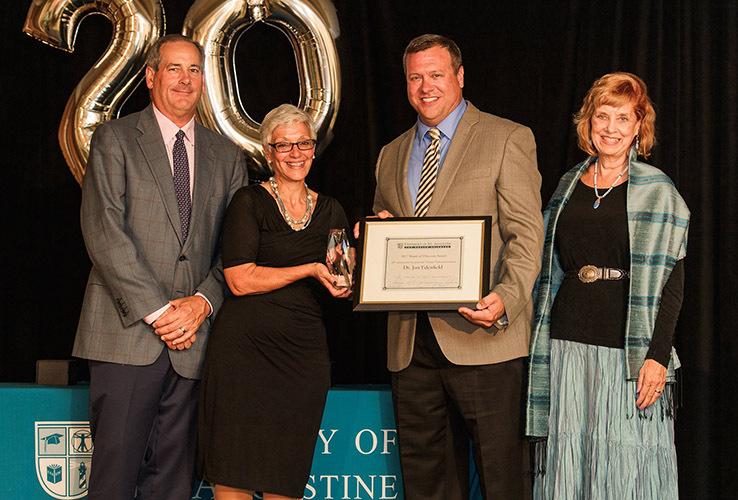 The 20th Anniversary Occupational Therapy Award ceremony was recently held in Carlsbad, CA. In addition to the 20th Anniversary Occupational Therapy Professional Award, the university’s Board of Directors also honored Dr. Katherine Wilford and Dr. Shannon Groff with an Excellence in Teaching Award and Dr. Mary Zadnik with an Excellence in Innovation award. For more information on USAHS, visit www.usa.edu.